There are 4th of July celebrations and then there are real 4th of July celebrations. Nashville belongs in neither group. It is in a tier of its own, with the 2nd biggest fireworks display in the entire nation (and the largest one in the south) and over 100k people that turn out to watch it. The only word appropriate for this scenario is damn (pronounced dayum). I had never seen so much unironic USA gear in so many different forms – frayed shirts, half-shirts, t-shirts, western shirts, pants, shorts, leggings, dresses, hats, bandanas, all of it all together and all at once with a cold Bud in hand. Having seen the crowds in person, I was curious about what Twitter usage was like on the 4th. I compiled some fake data, did some fake data crunching, and made a pie chart that you can see below. 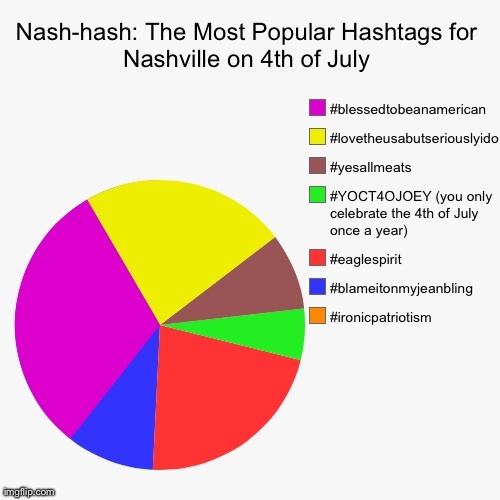 I think you’ll also come to my conclusion that the data shows that Nashville has the most unironic 4th of July celebration in the United States. Quick note: the ironic patriotism was .0001 of all hashtags. I included it for contrast and diversity.